Pond Fountains :: EFS-3000-E Big Pond/Lake Fountain. Home/Pond Fountains/EFS-3000-E Big Pond/Lake Fountain. 2 complete sets of spray heads in both 3 tiered and trumpet patterns (8 total) are included with this fountain. Please select 'YES' if you want a GFCI breaker built into the control box. Select 'NO' if you already have a GFCI protector in the circuit.The GFCI breaker package option is an additional $330.00 which will be added to the total price at checkout. The EFS-3000-E provides a large 30'H x 30'W fountain display in a 3 tiered, fanjet or trumpet pattern. The EFS-3000 fountain design is built using a combination of 3 each 1hp stainless steel submersible trash pumps mounted on a single float platform. 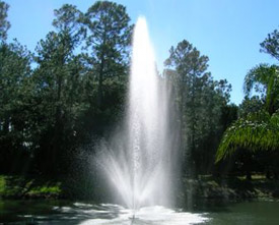 Our EFS-3000-E fountain is intended for use in natural and man made retention ponds from 2 to 4+ acres where maximum visibility and water aeration is required. The EFS-3000 is available for 230 volt, single phase hookup only. The EFS-3000-E fountain comes 100% assembled and is ready to install and operate right off the shipping skid. The EFS-3000-E is a new version of one of our longtime customer favorites the EFS-3000 fountain only with simplified controls. Please call Bill at 800-351-8814 to discuss your application. The EFS-3000-E is supplied with 3 each 1hp, 230v,1ph stainless steel submersible trash pumps. Our stainless trash pumps have 3 sets of seals instead of 1 set of seals like ordinary clean water pumps have. The 2 sets of internal silicon carbide on ceramic face seals and 1 outboard set of lip seals in the pump is why the pumps last so long. Our stainless trash pumps are not the cheapest pumps out there but they are likely the best pumps being supplied on any retention pond fountain available today. The EFS-3000-E includes 3 sets of spray heads (9 heads total) in 3 tiered, fanjet and trumpet patterns. Additional service cord is available on the EFS-3000-E up to a max of 300', see details below. The customer must provide a 240 volt double pole GFCI protected 30amp breaker at their main service panel to operate the fountain. Our EFS-3000-E severe duty fountain is for lakes and big ponds from 2 to 4+ acres. The fountain has a spray size of 30'H X 30'W sprays in a fan-jet or trumpet pattern and is built using 3 each 1hp, 230 volt, 1ph, 60hz stainless steel trash pumps rated at a combined total of 270GPM. The EFS-3000-E fountain is available only in a 208/230 volt model and it is rated 17FLA. The EFS-3000-E is designed for severe duty applications in retention, drainage or newly dug ponds where sand & debris concentrations are high. The stainless trash pumps we use contain two sets of silicon carbide face seals and an outboard set of lip seals, 3 sets of seals total, for the ultimate in service life when operating in dirty or sandy water conditions. The EFS-3000-E is a big impressive fountain and it is built using only Industrial grade components which will be beyond your expectations. The EFS-3000-E is comparable to other manufacturers $8,000 to $10,000 fountains in the same size range. The fountain comes 100% assembled and all you do is float it and drop 2 anchors where you want it to stay, hook up the power and you're done. Installation for this fountain takes less than an hour and no special tools are needed. The EFS-3000-E fountain is shipped by freight carrier, fully assembled and it weighs approx 280lbs. The EFS-3000-E comes complete with 3 each 1hp stainless trash pumps, 150' underwater service cord, T104-P Intermatic timer control panel, 3 sets of spray heads, float platform and bottom plate protector. Everything you need is included and the only modification available for this fountain is to extend the cord length if required. Additional cord is available up to a max of 300'. (Additional service cord price may fluctuate due to changing market copper prices.) Please call to order this fountain with extra service cord length. UPS Freight is additional. Shipping weight approx 280 lbs.